Nominate A Veteran Today! Veteran Of The Game Program Ready For New Seasons In Elmira and Binghamton! Ziff Law’s Annette Viselli Thorne, left, joins Army Spc. 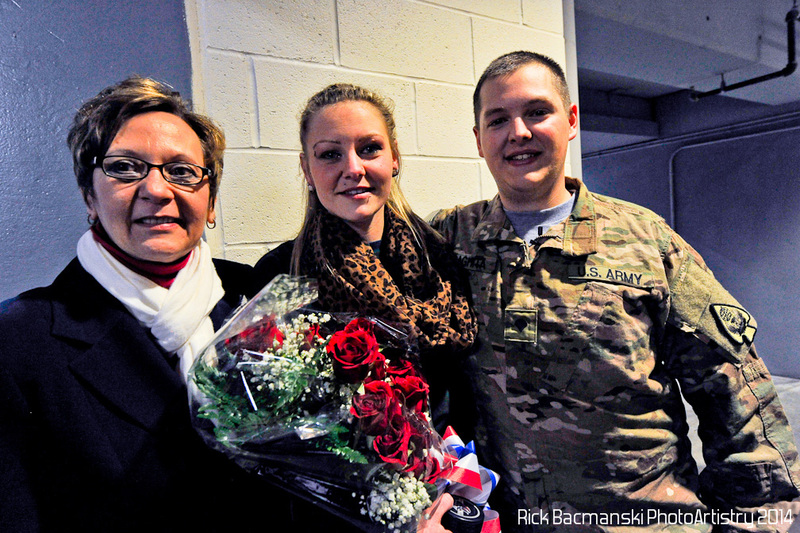 Albert “Joey” Daghita and his wife Brittany after a Veteran of the Game surprise homecoming in March 2014 at First Arena in Elmira. Hockey returns to Elmira and the Arena this fall with a new team. The Ziff Law Firm’s annual Veteran of the Game program is back this fall for hockey fans at two Twin Tiers arenas in Elmira and Binghamton. We are excited to be back home in Elmira while also saluting new veterans in Binghamton! It’s a great opportunity to thank Twin Tiers military veterans and active-duty military personnel home on leave for their service to our country. Veterans and military personnel generally prefer to avoid the spotlight, but at the Ziff Law Firm, we believe our Veteran of the Game program is an important reminder to all Twin Tiers residents about the sacrifices made by veterans and active-duty military personnel and their families, as well as the challenges they have to overcome after leaving military service. That’s why the Ziff Law Firm is proud this fall and winter to offer its popular Veteran of the Game program during professional hockey games in Elmira and Binghamton. First Arena in Elmira, the new home of the Elmira Enforcers in the Federal Hockey League, and the former home of the Elmira Jackals, who disbanded at the end of the 2016-17 season. Broome County Floyd L. Maines Veterans Memorial Arena in Binghamton, the home of the Binghamton Devils in the American Hockey League. The Devils drop the puck first, starting their season on Oct. 6 against the Toronto Marlies in Binghamton. Game time is 7:05 p.m. Learn more here. The Enforcers, a new team announced in July, open their season Oct. 26 against the Danville Dashers at the David S. Palmer Arena in Danville, Ill. Learn more about the new team here. The Enforcers’ first home game is Nov. 16 against the Carolina Thunderbirds. Game time is 7:05 p.m. at First Arena. Once a veteran or active-duty member is nominated (see how to nominate below), the program coordinator schedules their game and provides them with four free game tickets in a special seating area so they can sit together with family and friends at the game. During the game, the public-address announcer will introduce the honored veteran or active-duty service member and read a short biography of their military service. Once the biography is read, the announcer will encourage a round of applause for the honored military member, who can stand or remain seated as hockey fans let out a big cheer. Email: Annette Viselli Thorne, program coordinator, [email protected]. Call: 1-800-943-3529 or 607-733-8866 during business hours weekdays. Thanks for reading, and please nominate a veteran or active-duty military member today! This entry was posted in Breaking News, Choosing a Lawyer, Hometown Heroes, Miscellaneous, Veterans of the Game and tagged accident attorney, accident lawyer, chemung county, corning, elmira, Elmira New York, James B. Reed, Jim James B. Reed, law, lawsuit, Lawyers and Law Firms, Legal Information, NY accident attorney, Ny accident lawyer, NY lawyer, personal injury, Steuben County, twin tiers, upstate new york, upstate NY, Ziff Law Firm by Jim Reed. Bookmark the permalink.